The following post was written by Katherine Moore. Katherine has been teaching for The Perri Institute for Mind and Body since 2013. You can find her running all over New York City, working as a teacher, choreographer, freelance dancer, and writer. Relax with her at Steps on Broadway on Friday nights at 6:30pm for restorative yoga. These are the lazy, hazy days of summer. The days are long and hot, many people are on vacation, and projects are put on hold until after Labor Day. There's a sense of relaxation in the air, the urge to rest and recline takes over even the busiest brains. And yet, especially for the future-minded schedulers extraordinaire out there, the sense of anticipation for fall planning and activities begins to rear its head even though the true beginning of autumn is over 6 weeks away. This summer I've been taking a step back from some of my usual commitments, freeing up some time to figure out what really belongs in my day-to-day life and what doesn't. While I prepare for a new season in NYC this fall, I long to leave space in my schedule that will allow me to carry a sense of summer along the way. In particular, I want to take that stretched out sense of time that comes from a summer day. A summer solstice baby, I was born on the longest day of the year. Summer feels like my time. This year over my birthday I was able to take a lengthy vacation, spending time with family both in the Midwest and California. In both places, the idea of time kept cropping up across my path. I spent a day wandering through the old redwood forest at Muir Woods National Monument in California. Nothing beats the sense of quiet and age that you feel amongst those trees. To be surrounded by living organisms that existed long before I was even thought of has a certain way of putting things in perspective. What are my worries against the long path of nature? I also spent some time in Kentucky, surrounded by misty, forested hills and lakes that practically ooze history. At the prow of a boat, surrounded by a landscape rich with American history from the civil war to the Bourbon Trail, I was reminded that world is indeed, old. Even my vacation entertainment suggested something about the age of the Earth. While Jurassic World was perhaps not the most important film in cinematic history, there's something about contemplating the existence and demise of dinosaurs that puts one in her place. I also re-watched Lord of the Rings, encountering fantastical, ancient tree-like creatures called Ents that speak slowly, walk slowly, and...think......slooooowly. So perhaps I spent my vacation as a true nerd, but this concept of time that I encountered has continued to follow me back in real life in NYC. When dealing with troubling emotions, particularly anxiety and frustration, I find it helpful to think about time. I actually quite literally think about the dinosaurs, and then the age of the whole planet, and then the very, very, very small slice of time that humans have existed. Geological time is often best demonstrated with a clock; if the history of the Earth could be condensed into one hour, human life doesn't even come into the picture until the minute hand is at 59min. What?!! This broad perspective of time really puts me in my place. I feel like I can relax against the whole huge history of the world and let my worries lessen. It's not that my life suddenly becomes insignificant, quite the contrary. Something about this long view of time, especially in relation to nature, actually makes me feel much more connected to the world. There is safety in knowing that the universe has existed long before my troubles and will continue to exist long after my worries have gone, but that me, and my worries, and my joys, are all part of this continuum of time and space. During my break I also had the privilege of reading Ethan Nichtern's new book The Road Home: A Contemporary Exploration of the Buddhist Path. I know many of us in the Perri Institute community have added it to our summer reading list, and I think any contemporary, literate person would find this book to be both inspiring and immediately useful to his or her own life. The subject I found truly interesting, and most applicable to this post's discussion on time, is karma. We often view karma as some indictment for all the awful things that have happened to us, and all the awful things that have happened in this world. For example, after hearing a bit about karma as a child I remember thinking that, as someone with asthma, I must have done something terrible in a past life to not be able to breathe very well sometimes. That kind of “blame the victim” approach offers us a convenient new narrative for the recurring story of our self-aggression, as well as a reason to continue to isolate ourselves from the plight of others…This kind of isolated worldview cannot hold up when we look at the larger interdependent forces that shape our world and when we recognize that everything and everyone’s actions are affecting each other all the time, that nobody lives in a vacuum of their own making. …if we reflect on the past with the clear intention to illuminate our experience in the present, and we learn, through both our own meditation practice and guidance from others, how to let go of our tight grip on the past narrative at the exact point the mind begins to fixate on it, then our understanding of the relationship between past and present can come into balance and harmony. The teachings on karma demonstrate a very important point about the past: the fundamental force behind our conditioning isn’t stupidity or evil, nor is it a flaw in our genetic design. We adopt habitual patterns to begin with as the result of misperception, or lack of awareness. If we view the root of the problem as a misperception about the nature of experience, then forgiveness is always possible. We can rise out of feeling ashamed at our habitual confusion…We have to forgive ourselves for being stuck in habits and addictions, for being caught up in the commute. Working with karma is something that everyone has to go through; none of us are free of conditioning. I could go on and on, but I’ll just let you read the book yourself. What I found most interesting in this explanation of karma was the idea that I could be living a life where my past and my present were not in balance and harmony. Upon reading Ethan’s text I was struck by the idea that perhaps my attempts to live a more mindful life in the present moment, in the here and now, were not actually helping me slow time, but really making it go faster because of a lack of scope about time, and my life in time. 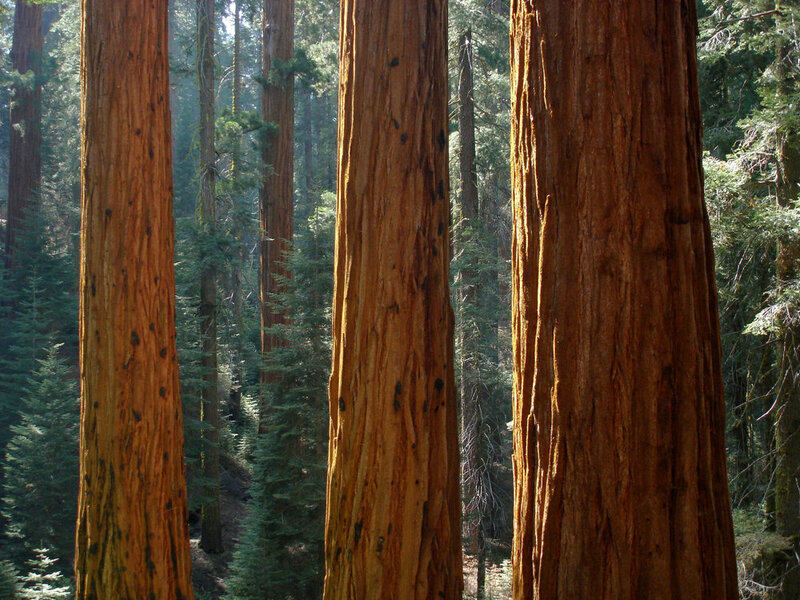 Perhaps a broader view of my life, or maybe even past lives, would increase my sense of awareness about the interdependence of my world and all the people, ideas, and redwood trees inside of it. Without reconciling my past habitual patterns with my experience of the present moment, my perception of the here and now will always be a little lacking. I know I’m barely scratching the surface here, and my philosophical understanding of karma is basic at best, but I think my point in all this talk on dinosaurs and summer and cycles of time is that from my experience, just saying “Slow. Down” as an antidote to the crazy fast pace of life isn’t quite enough. Sure, taking some time off and lessening my workload and sleeping more will make me a happier, healthier, more relaxed person. This is true of most people. But I am beginning to think that without an actual change in perception, without a shift in perspective about how my mind works with the present moment AND the past, I will continue to be unsatisfied by the ever quickening pace of life, no matter how much I pledge to “unplug.” I will continue to long for the stretched out days of childhood summers. Being in nature most certainly helps nurture this relationship between past and present. As a young woman of 28, I can stand next to a 130-year-old tree and feel young, but I can also look into the nest of hatching birds on that tree’s branches and feel quite old. Can we work with our mind in the same way? How can we experience this full range of our life in the present moment? Can we actually shift our perception of time? I don’t presume to know the answer, but as we enjoy sun-filled days on the beach and make plans for fall, I might suggest that we remain curious about what it really means to slow down. Does is it mean take a day off to sleep and order takeout and watch a movie? Maybe. Or maybe it’s something else a little less concrete, a little more subtle, and a bit more interesting. I recommend thinking about the dinosaurs quite often. It really does help.